Because we live in an area of the country that accumulates some of the greatest amounts of snowfall each year, the chances that your car, truck, or SUV appears less pristine than usual are great. Roads become covered with salt and dirty snow which mix together and create a film on your vehicle as soon as the thermometer rises above freezing. While washing your vehicle in the middle of winter may seem counterintuitive, because logic argues it will probably just get dirty again as soon as you hit the road, washing your car is actually an important maintenance procedure that can ultimately extend the life of your car, truck, or SUV. Michigan sits atop one of the largest underground salt deposits in the world and therefore, spreading salt on the roads as a means to lower the freezing point is a simple, effective and low-cost method to keep the roads clear. Unfortunately, salt (combined with moisture from melted snow) tends to form a briny liquid that can seep into every crease and crevice of your vehicle. And once there, it starts to corrode the steel from which your car, truck or SUV was manufactured. Worse yet, once rust starts it is hard to stop. And, it is not just the body and frame of your vehicle that is at risk of this. Any item that is exposed to the winter elements is at risk of damage including the exhaust system, brake lines, brake calipers, and gas lines. To best reduce the impact of this insidious winter threat on your vehicle, you must wash away the briny slush that has probably covered the underside of your car, truck or SUV. The very first step in this process is to, just before the weather turns cold, give your vehicle a thorough scrub down and wax job. Adding a coat of wax is important because it adds an extra layer of protection for the paint. Then, once it starts to snow, it is recommended that you wash your car as often as possible; perhaps as frequently as every other week. If you plan to wash your vehicle at home, it is necessary to obtain a bucket and a soft sponge. 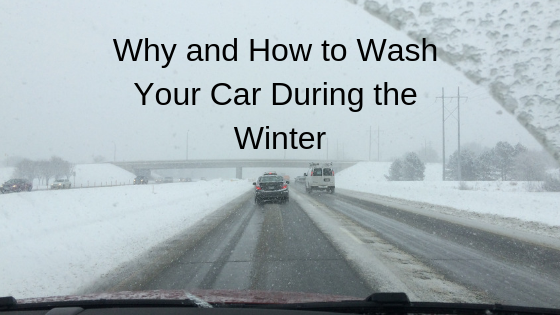 Fill the bucket with warm water and a soap that is specifically made for cars. It is not advisable to use dishwashing soap, though many people do, as it is much more aggressive and can strip off the wax of your vehicle. More importantly, if used frequently, dish soap can strip off the clear coat that protects your paint that was sprayed on in the factory. While washing your car, pay close attention to the areas behind the wheels, the quarter panels, and the front grille as these are the primary locations of where road salt collects. Using warm water to rinse the car will ensure that all salt, sand, and other contaminants have all be washed away. Drive-in car wash bays with power nozzles are an excellent option for self-washing your vehicle at any time of year but particularly effective in the winter months. Some are even fitted with infrared heaters, which help keep the temperature inside the wash bay as warm as possible. The powerful spray not only cleans the exterior of your car, but it also allows you to wash underneath the vehicle, where a majority of salt and slush accumulates. Make sure to be as diligent as possible while hosing down your vehicle, as salt and road crud usually manage to work their way into the most hard-to-reach places. The best time to wash your care is any time the temperatures are moderate — specifically above 32 degrees Fahrenheit. Washing on a warmer day guarantees that the power windows will not freeze, and that your defrosters won’t have to work double time to de-ice the windows. Even though you would ideally be washing your vehicle in above-freezing conditions, you always run the risk of getting wet when you wash your own car. Combine wet with cold and you are at a higher risk of catching a cold. So, remember to dress appropriately for the occasion: wear protective clothing that repels water, boots, waterproof gloves, and a hat. If you do not have access to waterproof winter gloves, wear a pair of latex gloves over your regular gloves; put rubber bands around your wrists to keep water from seeping in and soaking your gloves. Preventing rust and maintaining the overall cleanliness of the exterior of your vehicle should not take precedent over your overall health. Taking the precaution of cleaning the exterior of your car, truck, or SUV can help protect your investment from the ravages of winter, and will likely increase its useful life, ultimately resulting in either longer periods between times you buy a new vehicle, or by increasing the trade-in value of your vehicle.